of a sunset, raw red like war, westward. of middle England, unprepared once more. And still the fortress stands. This evening was still and beautiful in Warwick, with storm clouds receding and the sun emerging for the first time in a few days. The days are longer now, and the sun doesn’t set till round 9pm. The first lines of this poem came to me while playing tennis, and watching the clouds (I’m not a very serious player) and the rest is a slightly random meditation. I have no particular premonitions of conflict, but the future is a safely long time. The English are rarely prepared for change, I feel. The storm and earth lie fulfilled. This poem is for Jingle Poetry Potluck “Thunderstorms, floods and water fury”. of an ordinary day, you touched me. I was grateful. Time changed its usual pace. the place where you had been. I could not say, at supper, where I was. new in my soul, and clearer now, was you. Submitted to http://gooseberrygoespoetic.blogspot.com/. August 2011. A very small, and quick, poem for Wewritepoems prompt 55, “Everything, and how it all began”. I feel ‘their’ is the most important word in this poem. One is not enough. and said “you cannot go”. but said nothing, enveloped in my fear. The seasons passed us by. where you were is lost now, in the cold crowd. It’s my turn to stand out. or folly on the beach? you’re far beyond my reach. Submitted to Jingle Poetry Potluck. This is one of an occasional series on castles I’ve been doing since last year. Under this awning, feeling like van Gogh. with empty eyes, seeing only others. Beer on the table, a scooter passes. lassoed momentarily by this light. In London for a conference. A haiku, for one single impression. mystery still, after each thousand years. old lives and new potentialities. ski poles to her great slalom of delight. Possibly a meditation on recent weddings, but intended as more general reflection I think. Submitted to Poets United. Unsure of his direction, he sought the sun. Long gone, the shadows of treetops teased the moon. and vanished after a shrew, under a holly bush. Sounds suggested purpose elsewhere, sharpening his gloom. The clock ticked, and ticked again. My contribution to this week’s Thursday Poet’s Rally – free verse. 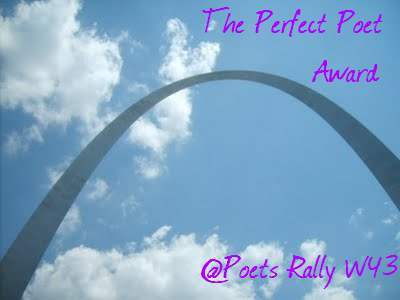 Thank you for the Perfect Poet Award – you can find the other winners here. Here’s a little haiku about poetry for Jingle. a grey world eats everyone. You make it such fun!